Sunchokes is a plant that is easy to grow and produces abundant harvests. Its tubers have a delicious nutty flavor. We You can start your sunchokes plant from tubers from a grocery store. We planted it in a small container and within just a few days the plants emerges from the tubers and its ready for transplanting into this wine barrel or a whiskey barrel container. You do need a lot of space for the plant to grow so we recommend that you use a large container and growing in containers is easier than growing this in the ground. Water well and make sure that your sunchokes plant always stays watered. The soil mix that we’re using is a mix of some existing potting mix with some sand added to the potting mix. Plants like sunchokes love having some sand in the soil. yellow flowers that look like sunflowers or yellow daisies. As far as fertilizers go, you can use some fish emulsion and seaweed mixed in. Fertilize this plant about two or three times during the growing season. This plant doesn’t need a lot of fertilizer, just make sure that I used a good mix of compost and sand for the potting mix. 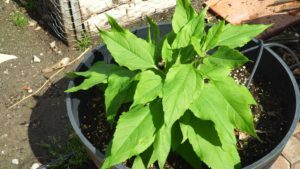 This plant get very tall, up to 10 or 12 foot tall and will grow some beautiful yellow flowers as well. Note that some Jerusalem artichokes or sunchokes do not produce flowers. Make sure that you are growing your sunchokes plant in a location that receives about six to eight hours of sunlight every day. This plant loves sunlight and thrives in sunny and warm conditions. At 162 days since planting, they are ready for harvest. The plant forms a lot of tubers around the base of the plant and below the roots. If the roots have a lot of hairs on them you have waited too long. Here is how the harvested sunchokes tubers look like, they are just amazing. The sunchokes plant produces tubers that have carbohydrate in the form of inulin and not starch which means that it’s very beneficial for people that have diabetes. The carbohydrate doesn’t break down as quickly as starch and the sunchokes is very similar tasting to a potato but it has a nuttier flavor. ← California Garden Tour July 2018 – Gardening Tips, Harvests & More!